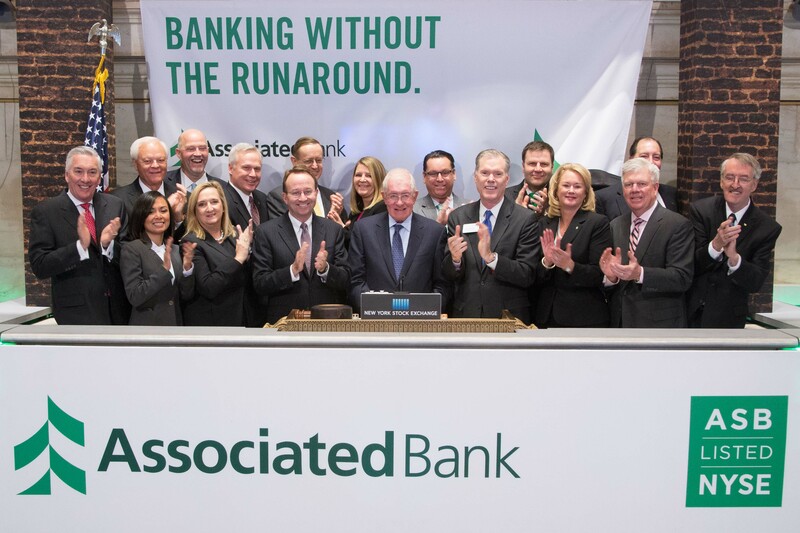 Associated Bank (NYSE: ASB) recently rang The Opening Bell® at the New York Stock Exchange (NYSE) in recognition of the company’s recent transfer to the Big Board. Company representatives, including President and CEO Philip B. Flynn and Board Chairman William R. Hutchinson rang the bell ceremoniously. “For the past five years, we have pursued an ambitious agenda to differentiate Associated. A big part of this is our focus on removing barriers that stand in the way of delivering a great customer experience,” said Flynn. "Our ability to achieve this is enhanced by our status as a regional bank; Associated is small enough to build meaningful customer relationships, yet large enough to deliver a full suite of products to meet complex financial needs." Among those joining Flynn and Hutchinson were Associated employee ambassadors Carmela Spurlock of Illinois, Angela O’Neill of Minnesota and Wael Rashidi of Wisconsin, representing the company’s 4,300 colleagues across its core tri-state footprint. The three were chosen by Associated’s executive committee based on their commitment to customer experience and the value they bring to the company. The employees presented a $30,000 donation to be divided among Junior Achievement districts in Chicago, Green Bay, Wis., and the Twin Cities of Minnesota in honor of the NYSE. Associated officially joined the NYSE on Dec. 23, 2014. The bank transferred its listing of common stock from the NASDAQ Global Select Market. With assets of $27 billion, Associated is the largest bank headquartered in Wisconsin. In line with nationwide banking trends, Associated has invested in innovating its customer experience across channels. The bank has revitalized its branch strategy to focus on convenience for customers, such as instant issue debit cards, in-branch digital capability demonstrations and “express” branch banking. Associated continues to invest in digital channels, wrapping them in a human-centric customer service experiences. Together these offerings strengthen Associated’s commitment to providing customers with convenient, intuitive and safe banking solutions.